Even in a sea of deeply impaired gold equity valuations, this gem stands out. For the small minority of investors out there that actually have made room within their nest eggs for a slice of silver and gold, most will select from a small set of predictable vehicles. Many have no doubt abandoned the mining and exploration equities altogether given their dastardly trailing underperformance -- to an admittedly shocking degree -- vis-à-vis the popular bullion proxies SPDR Gold Trust (NYSE: GLD) and the iShares Silver Trust. For those intrepid souls determined to stand strong with precious metal equity exposure -- presumably sharing my bullish expectation of a major reversal of fortune once the metal prices regain their momentum -- most will likely settle upon the closest things we have to household names in the sector. Although I wholeheartedly condone the inclusion of superstars like Goldcorp and Silver Wheaton (NYSE: SLW) within a well-crafted basket of gold and silver selections, I encourage Fools to dig a little deeper into this forlorn and under-followed galaxy of stocks to find their own diamond in the rough. I think I've located one particularly attractive stock that, perhaps in part because it's not listed on a major U.S. exchange, continues to fly under the radar of most U.S. investors. This isn't the first time I've loaded up on shares of Sabina Gold and Silver (Symbol "SBB" on the Toronto Stock Exchange; "SGSVF" for U.S. investors through the OTC market). I first built a position back in 2006 as the company enjoyed terrific exploration success at a polymetallic project called Hackett River in Canada's Nunavut Province. I enjoyed a powerful multi-bagger performance before locking in gains in early 2011. Thereafter, the stock suffered a dramatic decline while the sector turned suddenly sour, and my Foolish bargain-hunting radar began to sound. As a result, I selected Sabina as one of my "Top 10 Gold Stocks for 2012." With the Hackett River project strategically divested in a most ingenious way (see below), an investor's gaze falls squarely on the face of Sabina's flagship Back River gold camp. Back River is a closely spaced cluster of high-grade-gold deposits that continue to expand through Sabina's well-proven exploration prowess. Just last month, the company released a preliminary economic assessment on the project that estimates a net present value of $650 million (using a 5% discount rate) with a 25% internal rate of return. The study envisions a 12.3-year mine life yielding 300,000 ounces of gold per year at an attractive average cost of $542 per ounce. Gold investors are understandably wary of forward cost projections for mine projects in Canada's Arctic north following Agnico-Eagle Mines' (NYSE: AEM) frostbitten experience at Meadowbank, but Back River's robust economic projections are very well supported by an uncommonly high average-grade gold of 5.56 grams per ton for the project's indicated resource of 4.16 million ounces. 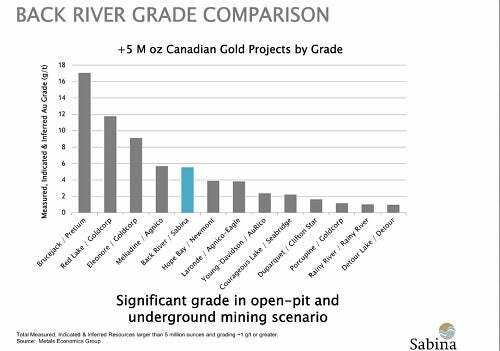 The following image from Sabina's current corporate presentation indicates Back River's lofty position among the highest-grade Canadian gold projects of substantial scale. As I have pointed out, Pretium Resources' (NYSE: PVG) phenomenal Brucejack deposit is now the undisputed king of ultra-high-grade Canadian gold, but with the fifth-highest average gold grade in the group, Sabina's Back River project stands-up extremely well against some high-quality competition. With a major 60,000-meter exploration program under way for 2012, and early results featuring a truly phenomenal intercept of 15.16 g/t over 36.4 meters at the Llama deposit, I see ample room for meaningful resource expansion as Sabina progresses toward a feasibility study. When Fools discover how much cash they have on hand to continue pursuing exploration and development of the property (see below), I think the outlook for value generation grows crystal clear. When I hailed Sabina as a golden standout among explorers last December, the company's impressive stash of $160 million cash, cash equivalents, and short-term investments figured very prominently into my investment rationale. After accounting for Sabina's exciting $52 million exploration budget for the Back River and Wishbone projects during 2012, $11 million for development work at Back River, and a $30 million private placement announced last week at a monster premium to the current share price, I see Sabina approaching the end of 2012 with a still-stacked treasury of roughly $125 million! When I sat down with Sabina Gold & Silver CEO Rob Pease at a Toronto mining conference in March, we spoke at length about the under-appreciated value of Sabina's silver stream royalty on the Hackett River project that Sabina sold to Swiss miner Xstrata. Sabina lays claim to 22.5% of the first 190 million ounces of silver produced from this world-class polymetallic project, and 12.5% of all silver production thereafter. Pease pointed out that "It's a high priority project for [Xstrata]; that's very clear. They're talking publicly about being in production by 2016 or 2017. So we think by 2014, they're clearly going to be talking about making a construction decision." Silver stream specialist Silver Wheaton has remained very quiet on the acquisition front for some time now. But as Xstrata's project parameters for Hackett River come into clearer view, I see strong potential for Sabina to realize significant shareholder value from its existing silver stream. Silver Wheaton owns 7% of Sabina's shares. Sabina's market capitalization presently stands beneath $400 million. Adjusting for the $125 million that I foresee the company holding at year-end, after a large and value-generating exploration campaign, the market has ascribed a laughable value of roughly $275 million to Sabina's mineral assets. That amounts to about $66 for each of Sabina's 4.16 million ounces of high-grade gold in indicated resource at Back River alone; to say nothing of its major silver stream interest in Hackett River, the promising Wishbone project ("a highly prospective extension of the Hackett River Greenstone belt"), and the strong potential for further resource expansion at and progress toward construction at Back River. Under the capable direction of Rob Pease, who has achieved powerful multi-bagger stock performance before as CEO of Terrane Metals when that company was acquired by Thompson Creek Metals (NYSE: TC), Sabina Gold & Silver looks preciously poised for powerful blue-sky potential. I think Sabina might just be the best-kept secret in gold, but I'm interested to hear what you have to say in the comments section below.